ITV has updated their promo site for MIPTV, a yearly television market event in Cannes, France. See this link: http://mip.itvstudios.com/. There are promo trailers for several ITV series, including Poirot and Marple. Both trailers are unchanged from last year's event, I think, which is somewhat disappointing as their trailer in 2009 previewed Murder on the Orient Express, and I was hoping for a glimpse of the final series. But if you haven't seen the trailer before, you might find it interesting. Also, they seem to have included a photo from the final series, one from Poirot's office (see below). Or, at least, I assume it is from the recent filming, because the pen and ink stand on the desk is different from any previous series, and the Marple promo definitely has a recent photo (from the filming of A Caribbean Mystery, I guess). 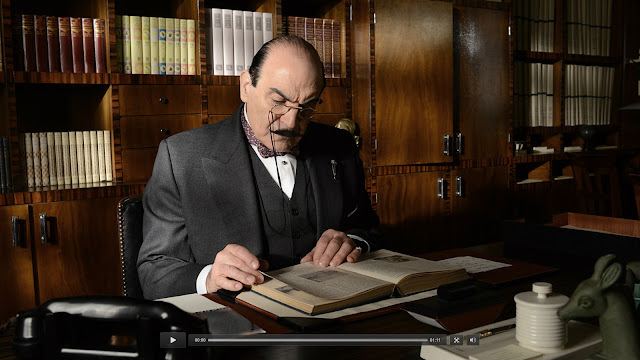 For over 25 years, David Suchet has portrayed the inspired Belgian investigator, Hercule Poirot; creating a unique catalogue of timeless crime fiction. In an emotional farewell, Suchet returns as Agatha Christie’s number one detective to take on his final cases. He promises to go out in thrilling style, conquering a global conspiracy re-uniting him with old friends Japp, Hastings and Miss Lemon; and delving into a dangerous family mystery with crime writer Ariadne Oliver. Finally, the detective returns to Styles – the location of his first case, and whilst he may be weakened by age and poor health, his mind is as sharp as ever. He is on the hunt for a killer, and with more victims succumbing, an incapacitated Poirot becomes desperate… At the final curtain, has he at last met his match? By coincidence, I stumbled over the websites of two members of the Poirot production crew: Ian Tomlinson (Art Department Assistant / Graphics Designer) and Andrew Lavin (Standby Art Director). 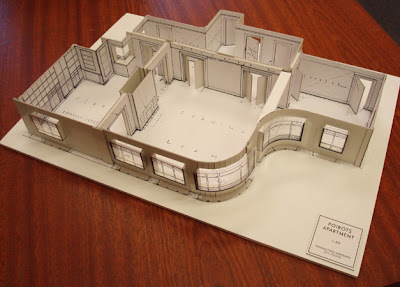 Tomlinson's website, www.tomlinson-design.com, had a photo of Tomlinson's model for Poirot's flat (see below, photo linked to his website, no copyright infringement intended). That is probably the most accurate floor plan we will ever get of the flat (see previous blog posts for other suggestions). Tomlinson also seems to have done some of the props for the series. 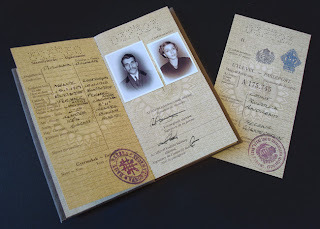 See, for instance, the passport of Count and Countess Andreyni from Murder on the Orient Express (below). I'm just delighted by the attention to detail they have on these adaptations, even down to birth dates of characters in a passport. Really!